Sen. Chuck Schumer (D., N.Y.) proposed using the Internal Revenue Service to curtail Tea Party group funding during a speech on how to "exploit" and "weaken" the movement at the Center for American Progress on Thursday. "It is clear that we will not pass anything legislatively as long as the House of Representatives is in Republican control, but there are many things that can be done administratively by the IRS and other government agencies—we must redouble those efforts immediately," Schumer said. "One of the great advantages the Tea Party has is the huge holes in our campaign finance laws created [by] the ill advised decision [Citizens United v. Federal Election Commission]," Schumer said. "Obviously the Tea Party elites gained extraordinary influence by being able to funnel millions of dollars into campaigns with ads that distort the truth and attack government." The Obama administration proposed new IRS restrictions on campaign related activity by tax-exempt groups last November. The rules would crack down on "candidate-related political activity," which includes advocacy "for a clearly identified political candidate or candidates of a political party" and communications that are "made within 60 days of a general election (or within 30 days of a primary election) and clearly identify a candidate or political party." Last May, the IRS admitted to singling out Tea Party groups for increased scrutiny when they applied for tax-exempt status. The scandal forced the resignations of IRS Commissioner Steven Miller and director of Tax Exempt Organizations Lois Lerner. Schumer was one of several Democratic senators who sent a letter in 2012 calling on the IRS to investigate tax-exempt groups for allegedly engaging in political campaign activity. He was also the architect of the 2010 DISCLOSE Act, legislation targeting the Citizens United ruling that failed to pass Congress. Senate Democrats introduced a similar bill in 2012. Schumer also proposed electoral reform in his speech. "Our very electoral structure has been rigged to favor Tea Party candidates in Republican primaries," he said. He argued that this is due to the political makeup of primary voters and gerrymandering by Republicans who "draw districts where a Democrat could never be elected." Schumer recommended a primary system "where all voters, members of every party, can vote and the top two vote-getters, regardless of party, then enter a run-off." The senator claimed there was a divide between what he called "Tea Party elites"—namely, the Koch brothers—who support small government policies, and the "Tea Party followers," who support government programs such as Medicare and public education. He said the small government mantra espoused by Tea Party leaders is the "core weakness of the Tea Party, and one we can exploit to turn American politics around to the benefit of our nation." According to Schumer, many Tea Party supporters are drawn to the movement because of their concerns about a changing country that "white Anglo-Saxon men are not exclusively running" anymore. 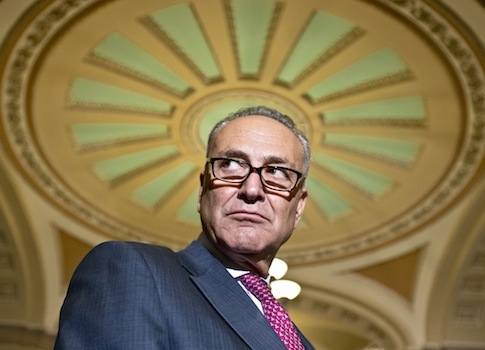 "The Tea Party rank-and-file know it’s a different America," said Schumer. "It looks different; it prays different; it works different. This is unsettling and angering to some." He also compared the Tea Party to the Prohibition movement, and argued that its policies were "the route of the Know-Nothings, Prohibitionists, Father Coughlins, and the Huey Longs, towards anger, negativity and even hatred." Schumer’s speech comes at a time when both the Tea Party and President Barack Obama are facing record-low approval ratings. Just 30 percent of Americans view the Tea Party favorably, according to a Gallup poll released last month, while 51 percent view the movement unfavorably. Meanwhile, President Obama’s job approval rating has plummeted to 43 percent on the heels of the botched Obamacare rollout, according to the RealClearPolitics polling average. His disapproval rating is also 51 percent. This entry was posted in Issues and tagged Chuck Schumer, IRS, Tea Party. Bookmark the permalink.